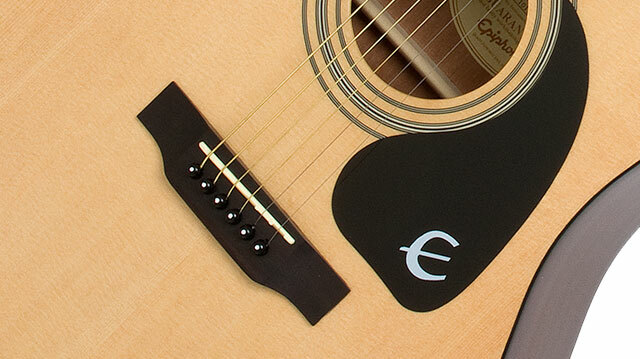 The DR-100 features a Select Spruce top. Spruce is a rich and complex tonewood that begins to breath and improve with age the more its played. So play the DR-100 as much as you can! The DR-100 body is made from Mahogany and the Okoume neck has classic dot inlays. The black vintage style pickguard is easy to spot on stage or across the room and has the iconic "Epiphone" E.
The DR-100 Mahogany neck is glued-in at the 14th fret and features a 25.5" scale, a SlimTaper™ shape with dot fret markers. Our iconic Sloped Dovewing headstock completes the look with die-cast premium tuners and is available in Ebony (EB), Natural (NA), and Vintage Sunburst (VS).